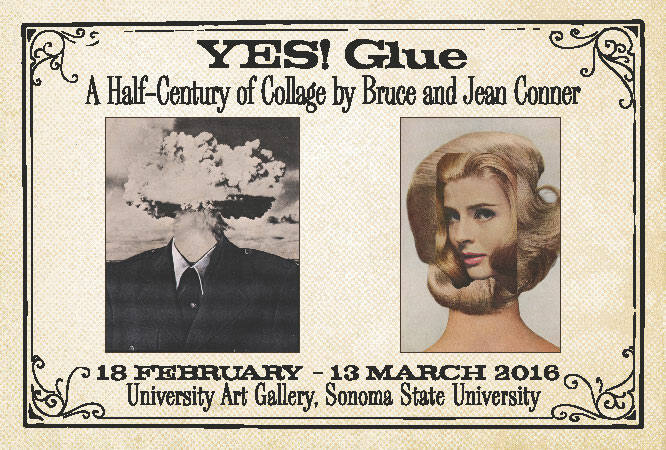 The University Art Gallery at Sonoma State University is hosting "YES! Glue: A Half-Century of Collage by Bruce and Jean Conner" Feb. 18 through March 13, with a free opening reception Thursday, Feb. 18, 5-7 p.m. Jean Conner presents a free walkthrough of the exhibition Thursday, March 3 at noon. The exhibition comes to SSU in advance of a major retrospective, "Bruce Conner: It's All True," which opens in July at the Museum of Modern Art in New York before heading to the newly-reopened San Francisco Museum of Modern Art. Collage--the art of cutting, gluing, and re-contextualizing found images from a variety of sources--has played a significant, if often subversive, role in the history of 20th century art. It was used by a group of Beat Generation artists living in the Bay Area during the 1950s and 60s, among them Bruce and Jean Conner. The title of the exhibition refers to the brand of glue they used for their collages. "Bruce and Jean Conner emerged from the San Francisco Beat scene in the late 1950's," writes Dr. Jack Rasumussen in an essay for the American University showing of the exhibition. "Bruce was already an artistic rebel, known for assemblages and experimental films while Jean had a much more reserved artistic presence. Bruce never used color in his collages, perhaps because he favored the unease evoked from a perfectly believable illusion of an alternate reality. Jean uses mass-produced images of American popular culture and advertising." The exhibition originated at the Katzen Arts Center at American University and was organized by Rasmussen, Katzen curator and director. "The Conners sustained separate but related explorations within the tradition of surrealist collage," writes Rasmussen. "Jean began to create her wry combinations of images from popular magazines in the mid-1950s. Bruce embraced witty, often grotesque, and sometimes spiritual compositions built from 19th-century engravings." Bruce Conner died in 2009 and Jean Conner continues to live and work in San Francisco. The University Art Gallery is open Tuesday-Friday, 11 a.m.-4 p.m., and weekends, noon to 4 p.m. Admission is free, parking is $5-$8 on campus. For more information, call (707) 664-2295.